Fantasy Football Librarian: Troy Polamalu and I have the same hair. Almost. Greetings from Ft. Lauderdale where it's so humid, my Colorado skin has no idea what hit it. I'm going to look like a member of an 80s hair band soon if this keeps up. 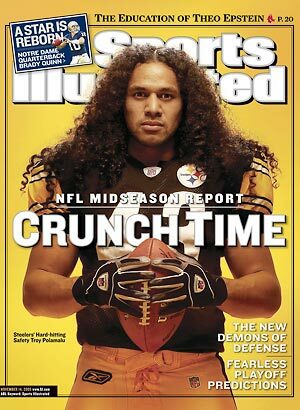 Or Troy Polamalu. My dad and I are having dinner with an aunt soon and then picking up my sister tonight at the airport - the family fun ends tomorrow and my sister's gaggle of friends arrive for the bachelorette fun. Right now though I'm really digging the down time with the fam. So let's get to some football - thanks for being patient with my travels today. The AccuScore guy and I don't see eye to eye on Marion Barber (for my thoughts on why he won't be a top 10 RB by the end of the season, see my column from the Bruno Boys) but I do really like most of the analysis in NFL Trade Market so take a look if you're in the market for mixing your team up a bit. GridironGremlins.com's Champs & Chumps is up for Week 6 - take a look at this fleshed out list and see what you think. I am of the camp that Nate Jackson might just benefit more than Daniel Graham with Tony Scheffler out, but I base that only in gut, no actual knowledge or news of events in Denver. Try Fantasy Tailgate's Starters & Slackers for more start or sit advice this week. I swear they've list Ocho Cinco here before with a "is this th week Johnson steps up his game?" comment, which frankly makes sense since I think we've all been wondering that week after week. I would like to once again point out the awesomeness of UltimateFFStrategy's advice-giving turnaround time. Check it - he will get back to you in 30 minutes if you post a question to his forum. 30 minutes! This guy must be superman, so take advantage. In a keeper league and wondering which guys are worth hanging onto as you deal with byes, injuries and other ups and downs? Get some advice from the FFGeekBlog's Mid-season keeper league prospects. Truly, few things are as solid of a read as the Weekly Gut Check from FFToday - this week's installment looks at that rad Strength of Schedule matrix and that we need knowledge and perspective, not just stats, to inform our decisions. He also reminds us all not to get too caught up in fantasy football...hmm, a lesson I can always stand to hear.